It is so terribly hot and I am wishing for Fall, so I pulled out some colors of the season for this card. Stamped Field of Poppies (Penny Black 4308K) on the Mustard color panel using Watermark ink, and also on the Sentiment (Thankful by Die-Versions). I then stamped and heat embossed the same stamp three times on a scrap of Burgundy card stock, and fussy cut the "wheat stalks". (Probably not what these really are on this stamp, but that is what I saw them as). I love using embroidery thread on my cards. I cut off what I need, run it through some glossy accents, let dry. Now the thread is more like a cord and it is "shapeable". How creative to use those wheat stems as if they were feathers!! Love it and wish I had thought of it! I had to go to Michael's to buy some fall colored paper .. can you believe it?? I am also so done with this heat!! Beautifully executed, Penny! 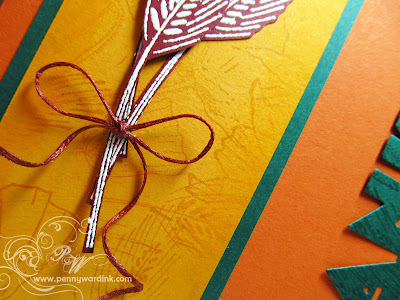 This is an elegant fall gratitude card!! GORGEOUS! Thank you for stopping by my blog, so now I have found yours! You do beautiful work! WOW.